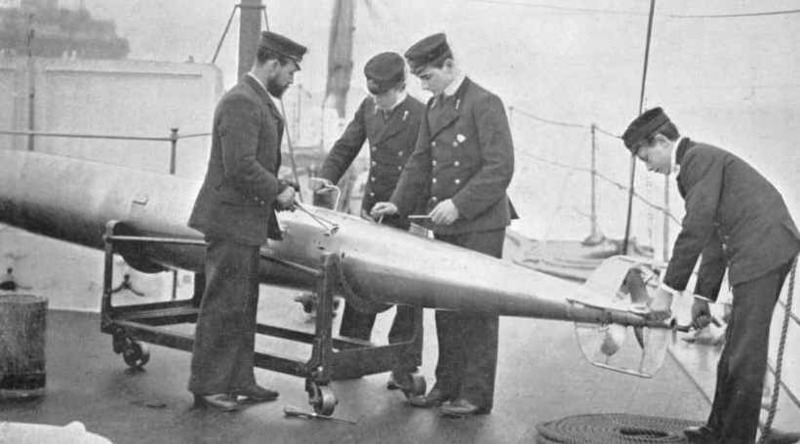 Midshipmen training on Whitehead Torpedo around 1896. Photograph courtesy of Steve Johnson of Cyberheritage. Had a working pressure of 2,000 psi (141 kg/cm2). Introduced on the 1908 members of the 'Tribal' class. 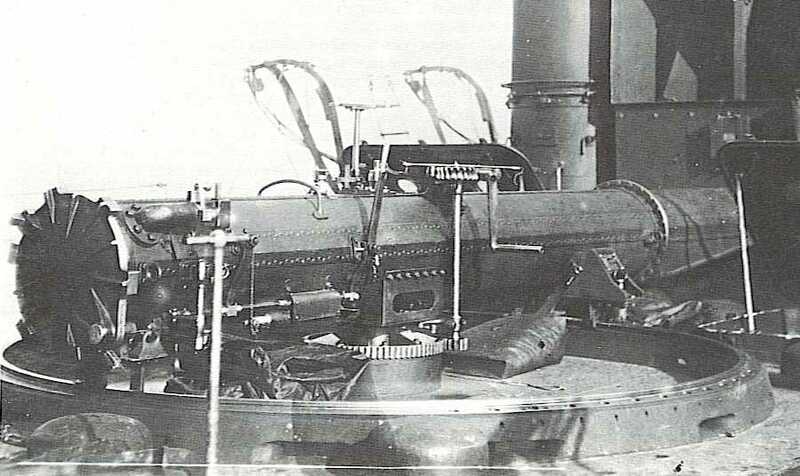 First Torpedo to be designed with wet-heater propulsion. Some Mark VI torpedoes were modified for aircraft use. 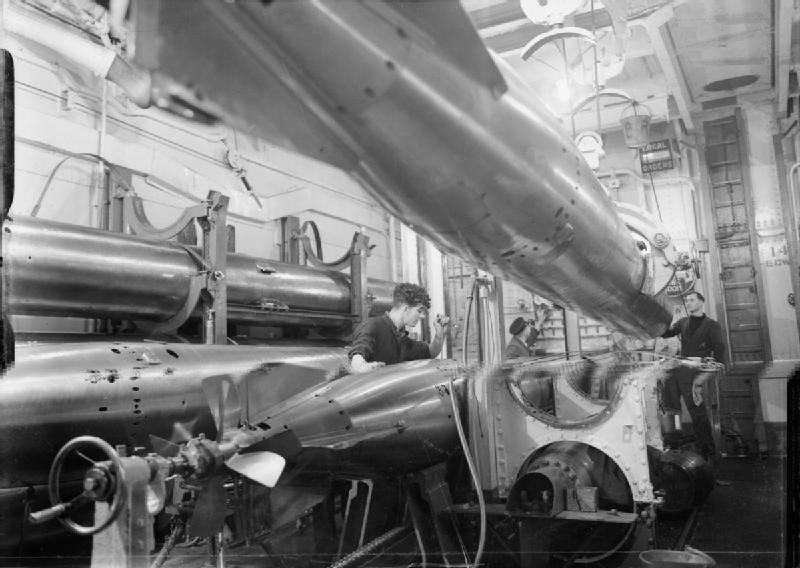 18" (45 cm) Torpedo Tube on HMS Swift. This single-tube installation was typical of early torpedo boats as torpedoes were thought of as being something in the way of "sniper" weapons. 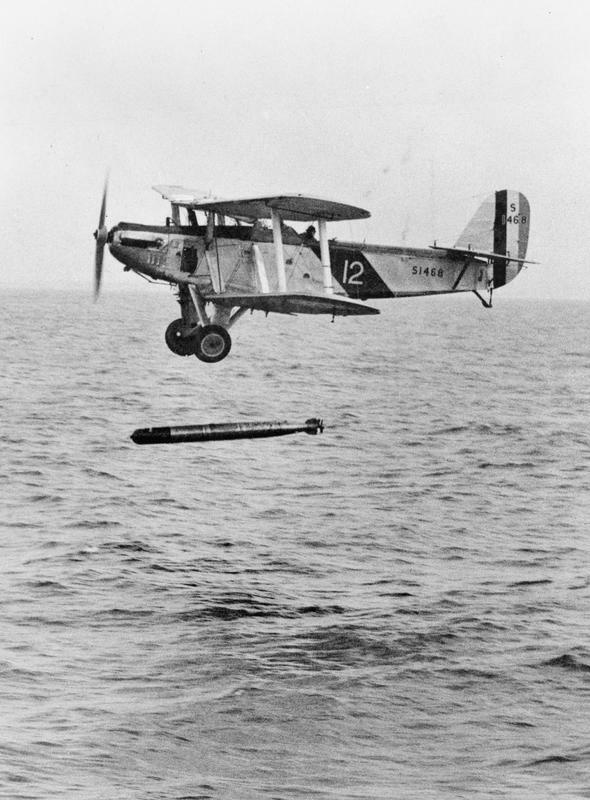 Well-known photograph of Sopwith T 1 Cuckoo dropping a torpedo during a practice run. Photograph from J.M. Bruce/G.S. Leslie Collection. 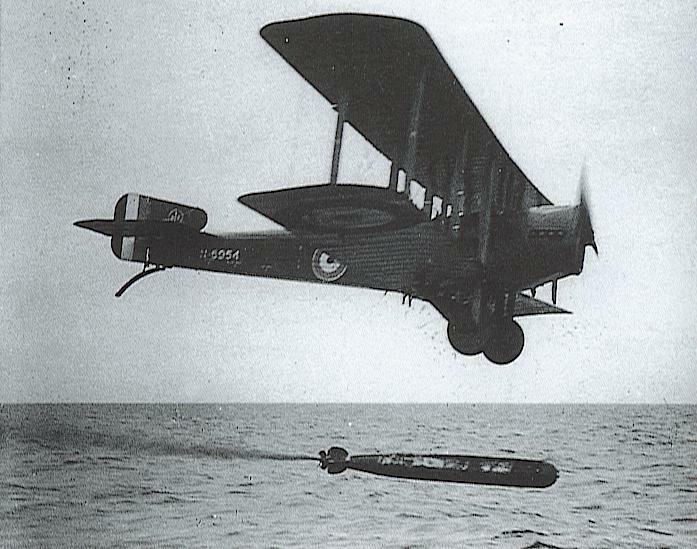 Blackburn Ripon Mark IIA torpedo bomber of No.811 Squadron dropping a torpedo during training. IWM Photograph Q 92900. 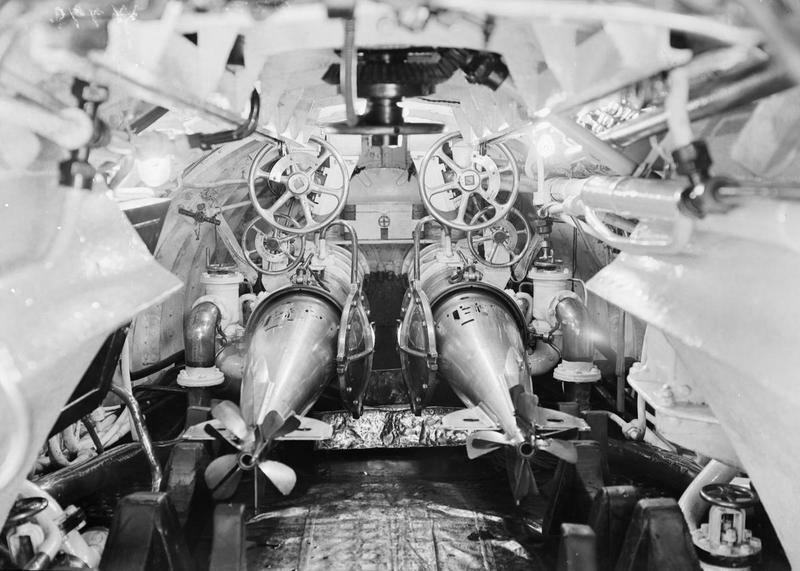 Torpedo room on unidentified submarine. IWM photograph Q 22668. Was specified to be able to be dropped from 30 - 100 feet (9 - 30 m) at 150 knots and not dive below 60 feet (18 m) and then recover to set depth within 400 yards (360 m). 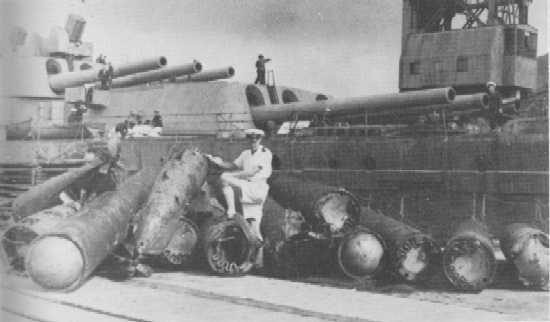 21" (53.3 cm) Mark I "Short" and "Long"
The first 21" (53.3 cm) "heater" torpedo. Introduced on the Beagle class destroyers. Cost £1,086 in 1914 and £1,193 in 1917. Earliest versions dated to before World War I. Still used on old ships during World War II. Also used on ex-US Lend-Lease Flush Deck destroyers during World War II. The earliest version had a high speed setting for 3,000 yards (2,700 m) at 45 knots, but it was erratic at this speed, so it was reduced to 35 knots. 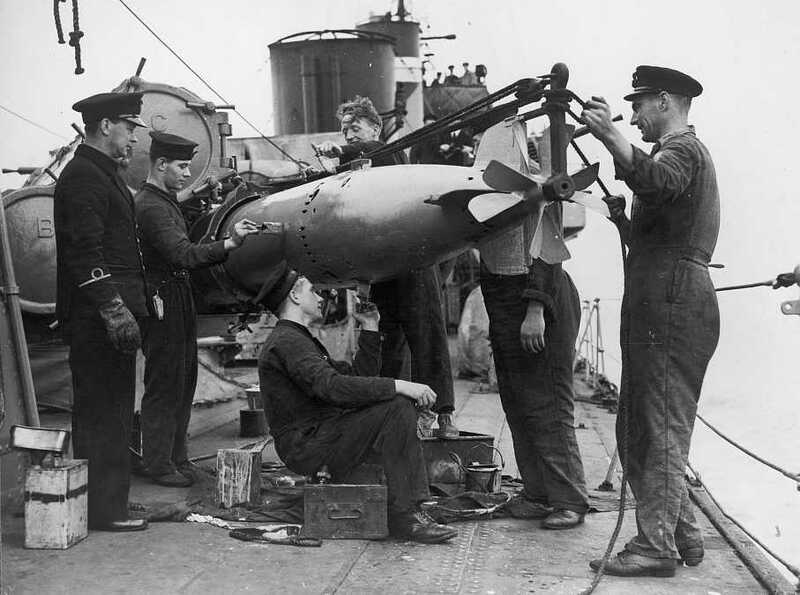 Preparing a torpedo aboard HMS Vanoc in August 1941. This is probably a Mark II or Mark IV torpedo. Office of War Information. Overseas Picture Division. Washington Division; 1944. Library of Congress Photograph ID LC-USZ62-132627. An improved version of the Mark II used mainly on capital ships. 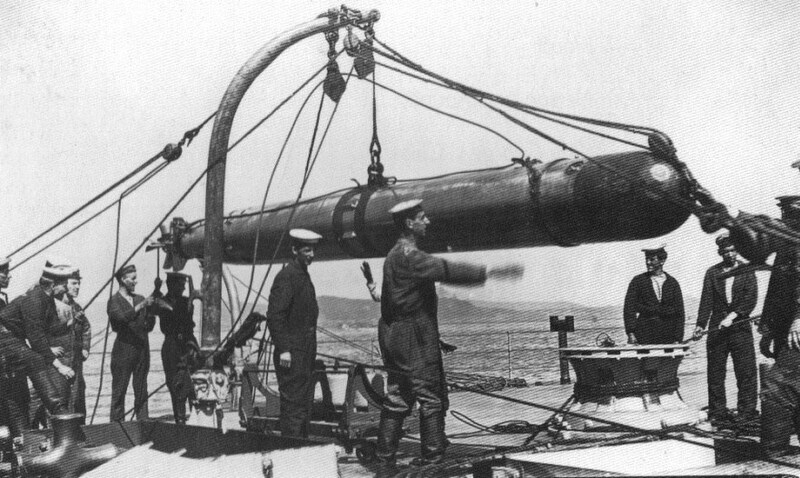 Hoisting a 21" (53.3 cm) torpedo aboard HMS Ramillies. Note the torpedo trolley. Loading torpedoes on an unidentified battleship sometime during World War I. IWM photograph Q 17941. 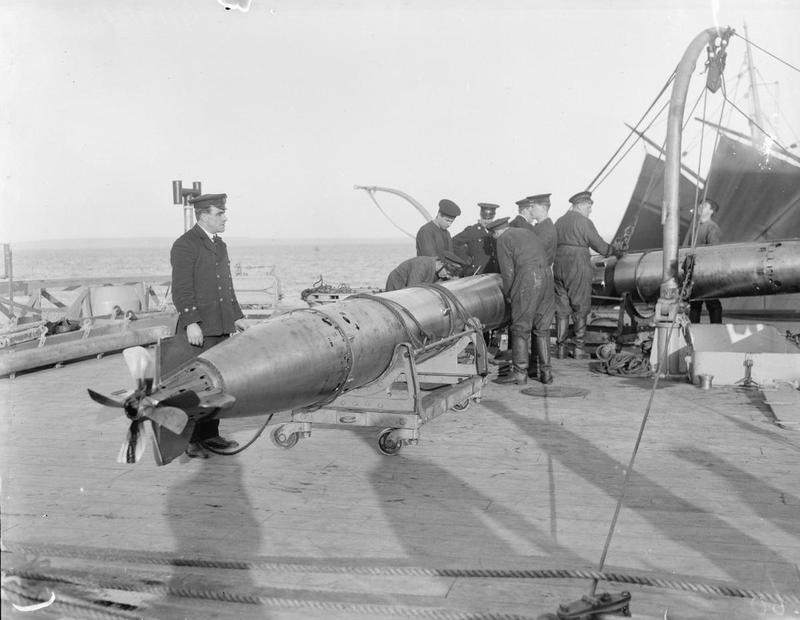 Principal British Torpedo of World War I. Still used in World War II by most older ships and by MTB's in the absence of newer torpedoes. For example, as commissioned the Royal Sovereign class carried 21 torpedoes which were a mixture of Mark II, Mark IV and Mark IV*. Replaced by Mark IX. Kent class cruisers used a modified version with a strengthened tail assembly. 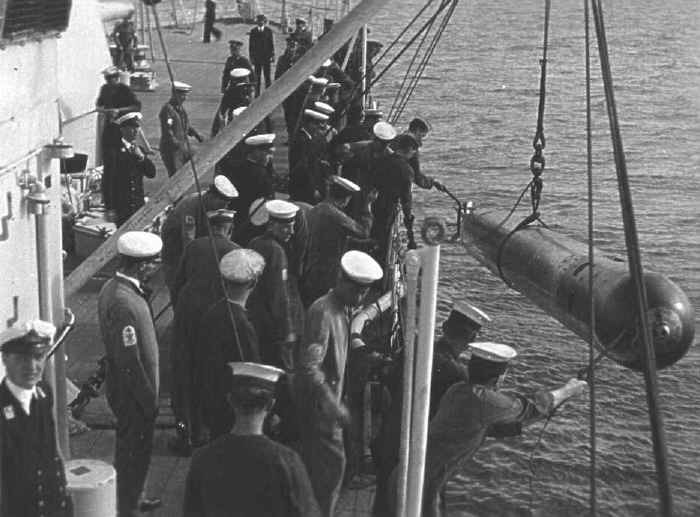 21" (53.3 cm) Mark V torpedo being hoisted aboard HMS York. Photograph copyrighted by Mrs. Josephine Burston and used here by her kind permission. These torpedoes were all converted to natural air during the early part of World War II. Carried only by Nelson class Battleships, the last battleship class designed with internal tubes. Wreckage of 24.5" (62.2 cm) Mark I torpedoes after HMS Nelson was torpedoed in 1941. IWM Photograph. Torpedo room on HMS Rodney. These are the same type of torpedoes that HMS Rodney fired at the German battleship Bismarck, the only known occasion that a battleship fired torpedoes at an enemy battleship. It is possible that one torpedo struck Bismarck. IWM photograph A 820. "Torpedo Warfare: A Successful Prediction" article by D.J. Lyon in "Warship Volume VII"
30 August 2016 - Added note for 21" (53.3 cm) Mark IV regarding quantity of torpedoes carried by Royal Sovereign class.